“What began as a cooling of prices in the capital’s prime and super-prime postcodes is turning into an ever more widespread frost,” one analyst said. LONDON – The London housing market is being blighted by “an ever more widespread frost,” as the city’s previously buoyant property prices continue to stutter, the latest data from Nationwide showed. 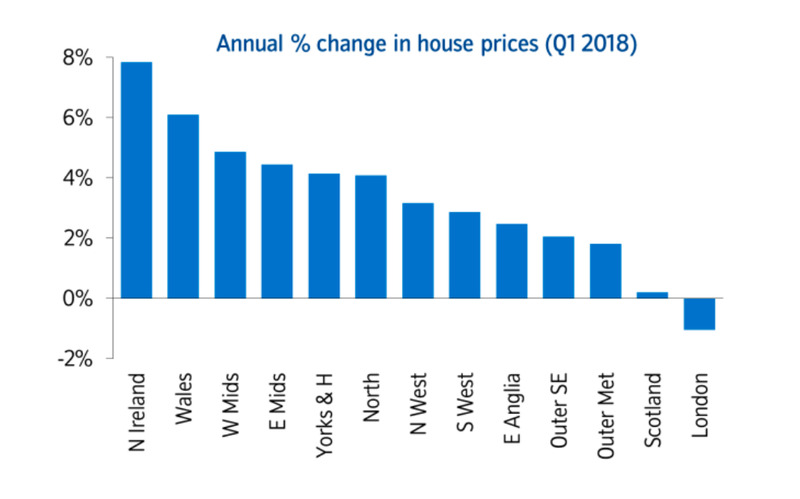 Prices in the capital fell by 1% year-on-year in the previous quarter, Nationwide’s monthly survey of the market showed, once again making it the weakest of all the UK’s regions in terms of price growth, a position it has held since late 2017. It was the only region to record negative price growth in Nationwide’s survey. “London’s property market shows no sign of giving up its wooden spoon, as the slowdown in the capital worsens,” Jonathan Hopper, managing director of Garrington Property Finders said in a statement. The best performing region in the survey was Northern Ireland, where annual price growth accelerated from 2% to 7.9%. 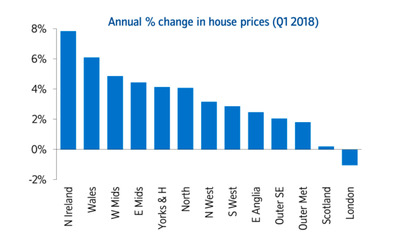 “Nonetheless, in contrast with other parts of the UK, price levels in the province are still well below their 2007 peak,” Nationwide said. The reasons for London’s property price falls are many, but it largely boils down to three key issues. First, mortgages. In 2014, the Bank of England introduced rules which ensured banks could only make 15% of mortgages on their books more than 4.5 times the borrower’s salary. That makes life particularly hard for buyers in London, where the affordability gap between salaries and house prices is biggest. Second, Brexit. Negative sentiment around Britain’s EU exit appears to be holding buyers back from moving house and that, in turn, is hitting demand and driving down transaction volumes. “The correction in prices helped buyer sentiment pick up a touch at the start of the year, and this has created a more free-flowing market as a steady stream of would-be buyers decide that it’s now or never,” he said. “The prospect of interest rate rises – which could come as early as May – is also likely to provide an extra nudge to those who had been sitting on the fence,” Hopper said.